Blake Lively married a Canadian. She’s been in Canada for a good part of 2013 as her Canadian husband, Ryan Reynolds, has been working on a film here with Atom Egoyan. And not just big city Canada but small town Canada too. Click here for a refresher if you missed those pics. Last night Blake was in Toronto for the Target opening. I only landed last night at 9pm so I missed it. But we have a Target here now, and just as we’re moving back to Toronto this summer! (PS. Do we get the Prabal line here too? Because the entire collection is wearable. Every. Single. Piece. And you can, literally, buy every single piece and still have enough left over to eat.) 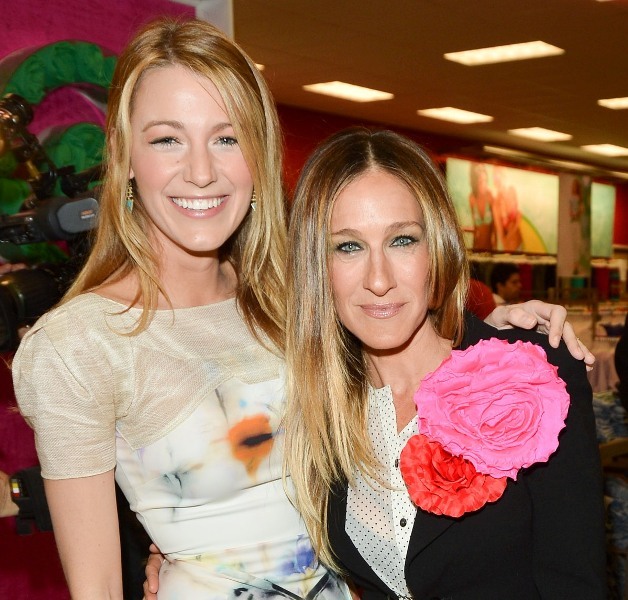 She and Sarah Jessica Parker were the two top celebrity guests. There’s exclusive footage tonight on @etalkCTV of the two of them greeting each other all super girly after walking the carpet. How much do you think they were paid for this flyby? And does she qualify as a mocktress? Blake also talked to our boy Dan Levy last night. Segues, segues -- Dan reviewed Spring Breakers for my blog at TIFF last year. Spring Breakers opens today. Click here to revisit his piece. Blake’s interview with etalk airs tonight at 7pm on CTV.